The Kingdom of Saudi Arabia’s rapidly growing economy, high rate of internet usage, mobile penetration and highly sophisticated infrastructure makes the Kingdom an attractive destination for hackers. The Kingdom of Saudi Arabia is ranked second globally when it comes to spam attacks and is leading in the Gulf Region in terms of cyber-attacks. The market for Cyber Security exports alone is estimated to grow to over $ 37.5 billion by 2016 with a growing rate 10% on the investments on Information Technology (IT) and Software year on year. Due to the growing public demand, there is a huge increase in the private cyber security exports across the energy sector, financial services sector, information technology (IT) sector, and communications sector. Recent cyber-attacks have created the need to establish a regulatory and legislative frame-works to support the Kingdoms cyber safety. As per the National Information Security Strategy the Kingdom of Saudi Arabia has increased cyber security spending and investment across government agencies and local governments. The Saudi Arabian cyber security market is expected to grow to over $3.48 billion by 2019, at a rate of 14.50%. The continuous attacks on energy sector has led to the high defense spending in the country. Over a period of time Middle East has become the center point of cyber attacks Energy and utilities is the sector which is targeted the most. Malware attack on Saudi Aramco and Ras Gas are amongst the events which have set an example to show the severity of losses caused by the cyber-attacks. Organizations are suffering from huge financial losses and thus facing unforeseen challenges. The growing political instability lack of government framework and awareness towards cyber-attacks among enterprises as well as consumers is what driving the cybersecurity market in Middle East. Increase in vulnerability towards cyber-attacks in growing energy, power and utilities industries is making cyber terrorists and foreign governments groups to penetrate and target IT systems for their own benefits. The rising DDoS attacks, phishing, security breaches in SCADA systems have been a common cyber trend of Middle Eastern countries in last few years. The growing sophistication of threats has forced businesses, government agencies and critical infrastructure operators to transform their business strategies and implement policies around cyber security in order to mitigate the threat impacts and lower down the expenses. This change in strategies has opened new areas of market growth in terms of both technologies and adoption across various industries, in Middle East. Companies such as Booz Allen Hamilton, Cassidian, Checkpoint, Cisco, CSC, IBM, Kaspersky, McAfee, Symantec and Trend Micro are few of the vendor’s active in Middle East cyber security market. Energy sector is the major contributor to the economy of Saudi Arabia. Energy infrastructures are often targeted by cyber-attacks, for instance, the attack on ‘Saudi Aramco’, which is the largest oil producer in the world. Investments in cyber security are made for the protection of energy systems and e-commerce spaces. The Saudi Arabian government has acknowledged the vulnerability of the energy assets, and hence the cyber-attack detection and prevention services are expected to address any related the issues. This trend offers an opportunity to foreign firms to enter the cyber security market in Saudi Arabia. Private financial institutions, technology firms, communications companies, and transportation providers are also likely to invest more in cyber security. The growth of cyber security solutions varies across the diverse geographies. Over the period of time Saudi Arabia has increased its defense spending. Moreover the country is currently spending to secure its energy systems and e-commerce space. The government has acknowledged the need of information security as well as spreading the awareness towards security threats. Companies such as Microsoft, Symantec, IBM, FireEye and various others are well established in the country and it is estimated that this market is offering great opportunity as compared to the other countries. Countries like Jordan, Kuwait, Oman, Qatar, Turkey and UAE has been identified as a high growth market for cyber security solutions in the near future. The Saudi Arabian cyber security market report further provides competitive benchmarking of the leading players in the industry such as Cisco Systems, IBM, Northrop Grumman, CSC, Symantec, and others in terms of their product offerings, key strategies, and operational parameters. The Saudi Arabian cyber security market report provides market trends, overall adoption scenarios, competitive landscapes, key drivers, restraints, and opportunities in this market. The Saudi Arabian cyber security market report aims at estimating the current size and the future growth potential of this market across different types, solutions, services, and verticals. 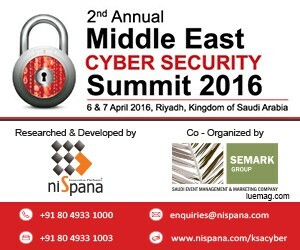 Hence, Nispana is proud to announce the Cyber Security Summit which is scheduled to take place on the 6 & 7 of April 2016 in Riyadh, Kingdom of Saudi Arabia. This summit will feature an array or presentations and interactive panel sessions from international experts to address current challenges faced and come up with strategies to pave the way for a cyber-safe future. The Cyber Security Summit will present all the participants with an excellent opportunity to network with peers, share divergent viewpoints as well as identify internationally renowned cyber security solutions that can be used to totally eradicate cyber-attacks. Any facts, figures or references stated here are made by the author & don't reflect the endorsement of iU at all times unless otherwise drafted by official staff at iU. This article was first published here on 14th March 2016.